The goal of the S-AFRIVAC project is ambitious: allow the development of a vaccine against a neglected disease of Africa that still today has no vaccine, endemic in this continent and showing increasing signs of AMR. 4. Completion of epidemiological, Burden of Disease and immunization sustainability studies. The batch of the vaccine will be produced using a technology conceived and developed in Tuscany, and the project will allow the completion of the preclinical development of the vaccine, offering the possibility to begin clinical trials as early as 2018. Moreover, an epidemiological model of the disease incidence and prevalence will be prepared in order to correctly estimate the burden of disease, proposing a sustainable vaccination strategy using the novel effective vaccine. Invasive Non-Typhoid salmonellosis is one of the major neglected disease of poverty endemic in Africa, against which there is not yet a vaccine, showing an increasing antimicrobial resistance that has been increasing recently. iNTS is a major cause of illness, septicemia and death in Africa, where infections are frequently fatal especially among children <5 years of age, but also in people affected by HIV, malaria, anemia or undernourishment. Because of the inadequate diagnostic tools, poor health care systems, failure of healthcare personnel to identify and test for iNTS, the disease is difficult to diagnose and often misdiagnosed with other diseases, especially malaria. The disease kills very rapidly, with about a 20% case-fatality rate in children. Furthermore, the strains causing iNTS are highly drug resistant and need expensive new generation of antimicrobials (often not available or too expensive) to have any chance to be treated with success. In recent years great progress has been made in providing an increasing number of effective vaccines against pediatric infectious diseases for low-income countries. Sadly, many other infectious diseases deadly for millions of infants, children and adults still remain without an effective vaccine. This is not because they are not technologically feasible, but because little to no money has been invested in them to fight epidemic diseases in developing countries. The new vaccine against iNTS will use a novel production technology named GMMA. The “Generalized Module for Membrane Antigens” (GMMA) is a new technology developed at the GSK Vaccines Institute for Global Health (GVGH) in Siena (Italy) and particularly relevant for low/middle-income countries, being highly cost-effective. The vaccine has been designed especially with developing countries in mind as very immunogenic, safe and easy to manufacture, encompassing a relatively simple production process. GMMA technology is self-adjuvanting, as surface polysaccharides and antigens are delivered in their native conformations. 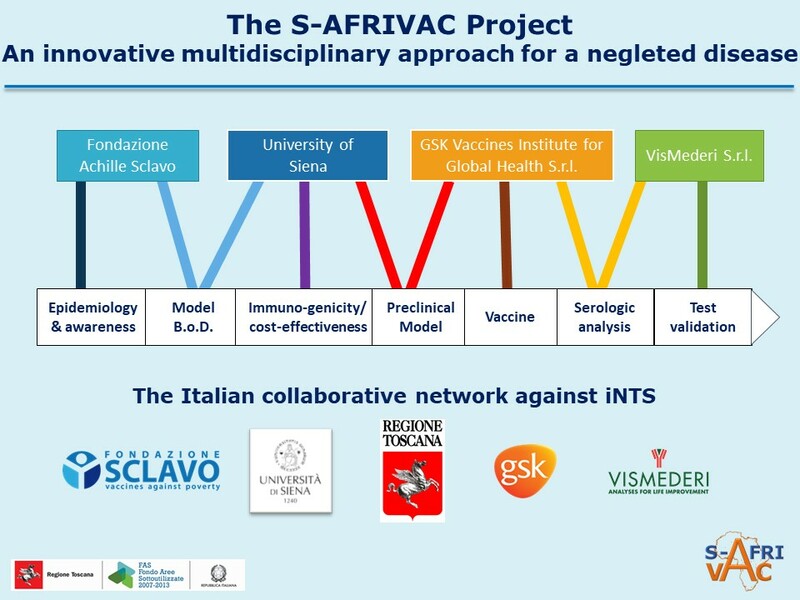 For all these reasons, the Achille Sclavo Foundation, thanks also to GSK Vaccines as well as to GVGH, is actively involved in the S-AFRIVAC project and attracting interest from public and private no-profit supporters. The targeted use of this innovative and reliable technology, together with a clear understanding of infectious diseases and their preventative measures on the part of the people and companies involved, make this project promising for the rapid development of a new, safe, effective and sustainable vaccine, particularly relevant for low/middle-income countries. The partnership is multidisciplinary: the project includes public research institutions, industry and private no-profit research entities: a very good example of a Collective Impact project, where all partners from different sectors bring their contribution towards a common shared social goal. The Achille Sclavo Foundation and the University of Siena are the two grant beneficiaries. Sclavo Foundation, in accordance with its mission to accelerate the availability of sustainable vaccines for neglected infectious diseases in developing countries, is acting as leader institution for the S-AFRIVAC project. Its tasks are first of all the scientific and technical coordination of the project, as well as the responsibility for attracting needed co-funding, production of clinical material for the phase 1 study, the creation of an epidemiological model of the iNTS disease aimed at correctly estimating its burden. 1. The molecular microbiology and biotechnologies lab (LAMMB) of the Department of Medical Biotechnologies will be investigating on the characterization of immunologic response in preclinical models, and performing protection assays with different immunization routes. 2. The Economic, Law and Science Department will be preparing a plan for the sustainable use of the vaccine in developing countries; considering both the R&S investments necessary for enrolling the iNTS vaccine and the costs for manufacture and for the immunization campaign in low-income countries. Private partner involvement is crucial for the S-AFRIVAC project. GVGH has developed a prototype vaccine for preventing iNTS based on the GMMA technology, already tested in a new Shighella GMMA vaccine currently in human clinical trials (ADITEC project, EU-FP7). GVGH acts mainly as supervisor of the vaccine manufacture, validating the quality of the final product and performing stability and toxicity testing in Good Laboratory Practice aimed at defining costs of this sustainable vaccine. The second partner of the project, VisMederi S.r.l., thanks to its broad experience in immunogenicity testing, is working on the serological tests to evaluate the immune response elicited by vaccination, developing quantification of functional antibody assay. The basis of S-AFRIVAC, as a balanced public-private / profit-no-profit partnership, is an innovative and reliable technology, together with excellent knowledge of infectious diseases and their preventative measures. These provide a good start to allow the rapid development of a new, safe, effective and low-cost vaccine. A previous successful experience in a similar collaboration was the collaboration between the Tuscany Region, the Novartis Vaccine Institute for Global Health (now GVGH), the University of Siena and the Sclavo Vaccines Association for the development of a pediatric vaccine against typhoid fever. Indeed, this vaccine has become a reality, being included in the GAVI strategic plan. There is not a shortcut for developing a vaccine for either advanced or less developed countries. Whereas, studies and the manufacture of a vaccine last an average of 10 years, S-AFRIVAC may be available for children and HIV-infected individuals in about 8-10 years, depending on the availability of funding to bring it to fruition. • Tennant SM et al Nontyphoidal salmonella disease: Current status of vaccine research and development. Vaccine. 2016 Jun 3;34(26):2907-10. Epub 2016 Mar 29. • Majowicz SE et al The global burden of nontyphoidal Salmonella gastroenteritis. Clin Infect Dis. 2010 Mar 15;50(6):882-9. • Crump JA et al Epidemiology, clinical presentation, laboratory diagnosis, antimicrobial resistance, and antimicrobial management of invasive Salmonella infections. Clin Microbiol Rev 2015 Oct;28(4):901-37. • Crump JA and Heyderman RS. A Perspective on Invasive Salmonella Disease in Africa. Clin Infect Dis. 2015 Nov 1;61 Suppl 4:S235-40. • Feasey NA et al Invasive non-typhoidal salmonella disease: an emerging and neglected tropical disease in Africa. Lancet. 2012;379(9835):2489-2499.